The Chuwi Hi9 Pro is a very interesting Android tablet from China with a promising spec sheet. But how good is it really? Read my review to find out more. The Chuwi Hi9 Pro is a very exciting tablet from China, that, at least on paper, promises a lot of features. It has a high-resolution 8.4-inch display, a deca-core processor and a metal back. In addition to that, we are getting almost vanilla Android 8.0 Oreo and integrated 4G with a dual SIM slot. So, is this “China Tablet” really as good as it seems? I’m Andrzej for MyNextTablet.com and this is my Chuwi Hi9 Pro review. By the way, usually, you cannot buy the Hi9 Pro at your local retailer. Instead, it has to be imported using shops like GearBest. That is surprisingly easy, and they are the ones who send me this review unit. You should keep in mind that warranties and support might not be as strong as if you get it locally. However, it is really cheap. Depending on the deal, it costs between 140 and 170 US Dollars. Both prices are very inexpensive. So, is it worth it? Let’s start this test. The design of the Chuwi Hi9 Pro looks quite nice. It’s black, with a red power-button and a rounded back. Because of that, it feels thinner than it actually is with 7.9 millimeters. The weight is alright with 384 grams but I wouldn’t call it super light. Considering the price, the build quality is pretty good. We’re getting a metal back and two plastic bars on the top and bottom. Even though it is a partly metal body, it does not feel as high-end as an iPad does. In fact, if you use a bit of pressure the tablet can creak a bit but you cannot bend it. I like that the power button and the volume controls are made of metal as well. On the top, we get a USB C port, which you can use to charge the device or to connect accessories like external hard drives. There is a standard headphone jack next to it and it works as expected. Additionally, we get a dual SIM slot on the top. So, if you want, you can use two SIM cards at the same time. However, one of those slots doubles as a microSD card slot in case you want to expand the storage. You can mount microSD cards as internal storage too. There is one single speaker on the bottom back of the Chuwi Hi9 Pro. As you might be used to from tablets in this price range, the audio quality is not that good. I would call it acceptable for watching some YouTube or Netflix. The speaker is loud enough for everyday use but you won’t be able to fill a big room with it. However, if you care about audio a lot, you will be disappointed. Compared to higher-end devices it sounds a bit flat and sometimes even scratchy. And, obviously, there is no bass at all. Small premium phones have a nicer sound. Well, on the other hand, no 8-inch tablet in this price range has good speakers. There is an additional speaker above the screen which is the earpiece for making phone calls. And again, the sound out of that is acceptable but not great at all. I’ve also been disappointed by the main camera on the back. While it has a resolution of 8 megapixels, pictures and videos look washed out and are not sharp or detailed at all. The 5-megapixel front-facing camera is not ideal either, but it looks sharper. That one is actually usable for video chats. Let’s get to the display of the Chuwi Hi9 Pro and this is one of the highlights of this tablet. It’s an 8.4-inch screen with an aspect ratio of 16:10 and a very high resolution of 2560 x 1600. Also, it is an IPS panel with good viewing angles and the display is laminated. So there is no air gap between the touchscreen and the IPS panel. Because of that high resolution, especially texts and icons look very sharp. It’s really nice to read e-books on here or surf the web. Colors look saturated enough as well and the contrast is good too. I’d also call the brightness bright enough. The Chuwi Hi9 Pro is certainly bright enough to use inside or outside on a cloudy day. However, in direct sunlight, it’s almost impossible to see something. It’s too dark for that. The touchscreen works very nice though. In fact, it feels as “smooth” as a higher-end tablet. It’s a bit hard to describe but cheaper tablet sometimes don’t have as a “smooth” touchscreen. So, especially when considering the price, the Chuwi Hi9 Pro has an outstanding screen. If the screen would be just a bit brighter, it would almost be as good as the one from the Huawei MediaPad M5 8. And that one costs more than twice as much. The very nice and high-resolution screen should be the reason why the performance is not as good as I hoped for. Inside the Hi9 Pro runs a MediaTek Helio X20 deca-core chipset that consists of ten cores. In addition to that, we get 3GB of RAM and a 32GB internal storage. For everyday use, the performance of the Helio X20 is good enough. I’ve surfed the web in Chrome, read emails, watched YouTube and swiped through Instagram without any issues. All of that works as it should. Occasionally, it can happen that you see some animation lag but that’s not too bad. In benchmarks like Geekbench 4 and AnTuTu, the Chuwi Hi9 Pro gets very good results. It’s much faster than other tablets from more famous brands in the price range. That included the Huawei MediaPad T3 8 and Lenovo Tab4 8, but also the Samsung Galaxy Tab A 8.0. Depending on the country and deal, they cost more or less the same. But as you can see from my benchmark comparison, they are much weaker. While the Chuwi Hi9 Pro is faster than those in my gaming test, it is not as good as the benchmarks suggest. Games like Asphalt 9, Modern Combat 5 or Into The Dead 2 run smoothly. But you have to set the graphics settings to low or medium. Players Unknown Battlegrounds Mobile is kind of playable at lowest settings. However, even with those, there is some lagging in between. I’ve been used to Fortnite on the iPad and compared to that, the performance of PUBG is very weak here. Chuwi is advertising the Hi9 Pro as a “Gaming Terminator”. But it is not a perfect gaming tablet. Yes, you can play a lot of games on here and they run without lagging, but you have to turn the graphics down. I think that’s due to the high-resolution display. It’s just too many pixels for the Helio X20. PUBG Mobile should have run fine if it would have a full HD resolution only. Now, when looking at the price, that’s actually not too bad. As I said, it’s faster than a lot of similar tablets. And, at the same time, it has a great display. But again, I wouldn’t call this a gaming tablet. The Chuwi Hi9 Pro has built-in LTE. And that is another reason why it is so interesting at this price point. I’ve used this tablet with a SIM card from the German carrier O2 and inside cities, it gets as a good reception as my phone. However, in some areas, the signal was a bit weaker. So, if you’ve got connection issues already, it won’t be better with the Hi9 Pro. But overall, the mobile internet worked quite nicely. If you want, you can use the Chuwi Hi9 Pro to make phone calls or send SMS text messages. That works just like on Android smartphones. As I mentioned earlier, the sound quality is not as good though. I wouldn’t recommend it if you are talking on the phone a lot. And in fact, I wouldn’t recommend it as a smartphone replacement anyways. That’s mainly due to the screen that is not bright enough in direct sunlight. I think a smartphone replacement should be usable at the beach. On the Chuwi Hi9 Pro runs Android 8.0 Oreo which is pretty good for a “China tablet”. I’m pretty sure though that we’ll never get a big update to Android 9.0 Pie. Sadly, that is highly unlikely with most tablets in this price class. But on the positive side, it is almost pure vanilla Android. There is no heavy UI on top. Because of that, it looks clean and tidy and not overloaded at all. That is awesome – especially because a lot of competitors like Huawei or Amazon use too heavy customizations and tons of pre-installed apps. In addition to the apps from Google, there is a file manager, a calculator, and an FM radio app. And that’s it. The Hi9 Pro supports all the features we know from Android 8. These include the split-screen-view and the Google Assistant. It works fine most of the time. Sometimes it didn’t recognize my OK Google command when standing further away though. 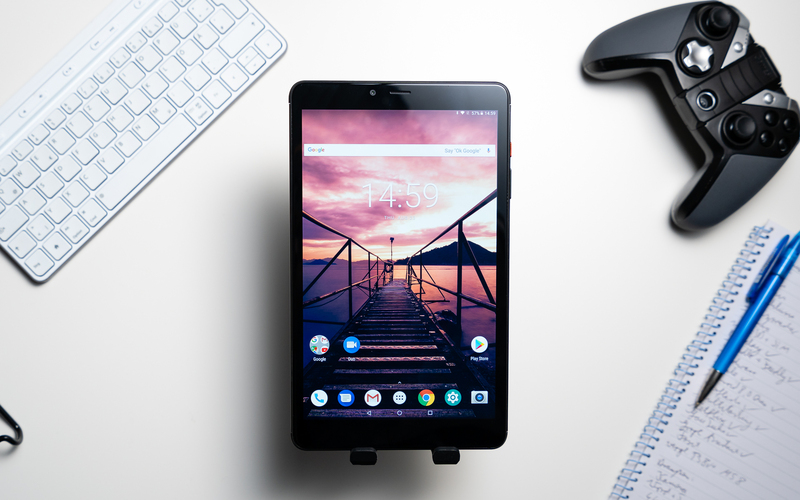 Android 8.0 Oreo itself runs very nicely on this tablet. Like I said earlier, it can happen that you see some animation lags. That’s due to the high-resolution again but not too bad. I also was able to find all the usual apps inside the Google Play Store. And that includes Netflix which sometimes cannot be installed from the Play Store with tablets like these. That means that the Hi9 Pro supports the necessary DRM standards. Sadly, that does not mean that you can watch Netflix in HD, you can only watch it at a bit lower resolution. In theory, that could be fixed with a software update and that’s what Huawei had to do ones. But again, I don’t think we will see a lot of updates here. Besides that, you can obviously watch videos in HD and above. With YouTube, you can playback 1440p. The Chuwi Hi9 Pro has a battery with a capacity of 5000mAh. In my battery test, that lasted for a runtime of just 8.5 hours. For this test, I’m always looping an HD video at 50 percent brightness and tuned on WiFi. As you can see in my comparison, a battery life of 8.5 hours is not that good. That is a problem with a lot of these cheaper tablets. The specs sound awesome at this price, but then they save with the battery. But alright, I guess Chuwi has to save somewhere to get to this low price. During everyday use, the battery life is acceptable. You should be able to get through a day with surfing the web in Chrome and watching some YouTube. If you are playing games or are streaming videos at maximum brightness in 4K, obviously the runtime will be much lower. Well, at least it does not lose much power while the display is in standby. Alright, this is the end of my Chuwi Hi9 Pro review. So, can I recommend this tablet? Considering the price, I think the display is outstanding, the build quality is solid and the performance is good enough for most. I also like that we are getting vanilla Android, a USB C port, and integrated 4G. On the negative side, the battery life is too weak. And the performance is not good enough for higher-end games, even though that is what the benchmarks suggest. In addition to that, it does not have any premium features like good speakers or a fingerprint sensor. However, at 140 to 170 US Dollars we get quite a lot with the Chuwi Hi9 Pro. So yes, I can recommend it, because it has a lot of value for the money. Especially if you don’t want to spend a lot, need a nice screen and if you don’t have high gaming-expectations. Let’s take a look at a couple of alternatives. A very interesting one is the Xiaomi Mi Pad 4, that should offer a better performance. The screen is not as high-resolution and it is more expensive… Well, I didn’t review it yet. Similar alternatives from well-known brands are the already mentioned Huawei MediaPad T3 8 (review) and Lenovo Tab4 8 (review). Depending on the deal, they can cost around the same. And, usually, they offer better warranties. That depends on the country though. While the performance and display are weaker with both, they offer a better battery life. A tablet that is a lot better is the Huawei MediaPad M5 8 (review). It features a much faster processor and premium features like a fingerprint scanner and good speakers. However, it costs more than double the price. Chuwi Hi9 Pro Review:Considering its price, the Chuwi Hi9 Pro offers an outstanding 8.4-inch display, a good build-quality and almost vanilla Android 8.0 Oreo. However, the performance is not as good as you might expect and it does not have premium features like a fingerprint scanner. However, again, considering its price, the Chuwi Hi9 Pro offers a great value.